Stepping on the scale can be a little stressful. In fact, for some, it can become a full-blown phobia. Today’s digital scales have even more to say than their predecessors. Some scales report hydration status, body weight, cardiovascular function, bone density, and of course that oft-dreaded measure of body fat percentage. As futuristic as some “smart” body weight scales may look today, for measuring body fat percentage they rely on a technique that has been used since the 70’s. This technique is called Bio-electrical impedance analysis (BIA). I first learned about BIA while studying Exercise Physiology in school. Over the span of twenty years, I have used BIA devices professionally with many thousands of individuals in our personal training business as they pursued their individual weight loss goals. This experience has taught me that Body Fat measurement and evaluation can be very helpful but that it can also backfire. Here are six tips to make using that digital scale in your bathroom less stressful and more helpful. BIA uses a minute electrical current that passes through your body from one electrode to another or several others. The body fat estimates that your scale generates are based on the fact that some tissues slow this electrical current down more than others as it passes through your body. Keep in mind that humans on average are made up of about 60% water. Cellular hydration though varies for each of us throughout any given day. This means that your estimated body fat percentage will vary significantly during the same day. When you wake up in the morning, and your cells are less hydrated, you will weigh less, but your body fat estimate will be higher! So here is my tip. Only use your scale when variables are as controlled as they reasonably can be. The most important thing you can do is pick a time of day that will be your way in time for a specific scale. I find it’s easiest to do it in the morning. Don’t get on your scale unless it’s at the appointed standardized time of day and you haven’t changed your routine. In statistics, reliability refers to the repeatability of a measurement from test to test. High reliability means that if you control variables, your measurement should be very close to the same from test to test unless something has changed. Sensitivity is about the accuracy of a measurement. At any moment we do have a true body fat percentage. Unfortunately, there is not a device on earth I would bet on to measure it with perfect accuracy. Different kinds of measures are known to have various standard error of estimate expectations. Here is what I have learned. It doesn’t matter. It’s nice to have a decent ballpark of body fat percentage to be able to compare to healthy reference ranges. However, you should focus on using your scale to detect change rather than give you an accurate measure. You want to know – am I improving my body composition, maintaining, or moving backward. While you can’t bet on BIA accuracy, these devices are pretty reliable, and therefore they can be very useful for detecting change. For twenty years I have had the pleasure of continuously holding what seemed like common sense views pretty far ahead of the curve. For example, as a personal trainer, I focused on strength training for weight loss and wellness long before widespread acceptance. When it comes to weigh-ins, I have always gone against the grain and recommended daily weigh-ins. New research supports this approach. The findings are compelling enough for David Levistsky, a professor of nutrition and psychology at Cornell University to say. 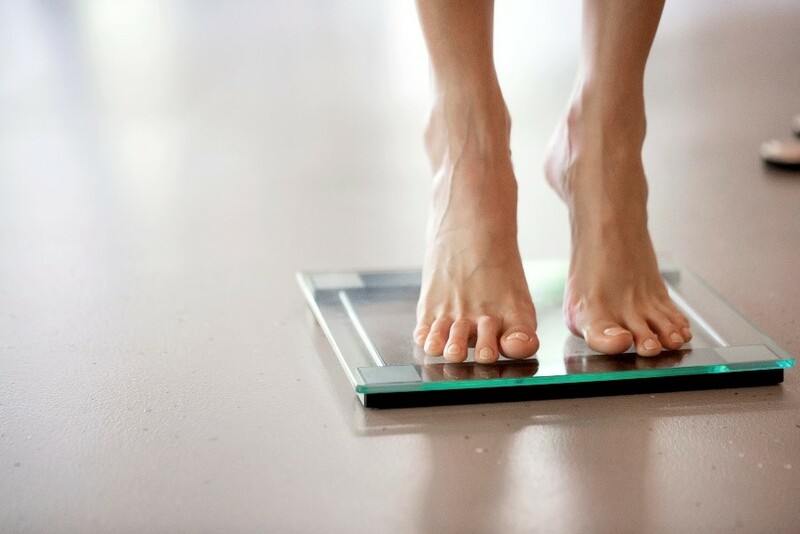 “Stepping on the scale should be like brushing your teeth. In addition to increasing mindfulness, this daily rhythm creates the data set necessary to do meaningful analysis of what’s going on with your weight loss and wellness. There will be fluctuations in what the scale says even if you standardize the process. If you space out your weigh-ins too much, you are at the mercy of chance, and you risk painting a picture that puts too much “weight” on your most recent reading on the scale. As I have repeatedly said, you will see variations in measurements from day to day. The smartest thing you can do for your psyche and to gain true insight into the effects of your efforts is to compare the averages of your readings for chosen time periods. So for example, you can take all of your daily readings for a week, add them up, and divide by the number of days you added together. This will give you your average for the week. Ideally, you have seven data points. Record these averages and track them from week to week. This will smooth out the highs and lows from your data and provide you with feedback on a weeks worth of effort. Next, you can add up four weekly average values and record that as a monthly value. Record the monthly value and track your month to month changes. This simple methodology makes you smarter than all of the supposedly smart weight loss technologies on the market using artificial intelligence to guide your efforts. And, it takes the edge off of a single reading that didn’t feel so good. Here is an example of a weekly average visualization. Even weekly averages exhibit the”sawtooth” pattern characteristic of physiological changes that occur over time. By now you have probably already picked up on my belief that the key to meaningful and helpful fitness tracking is the following of trends. I have shared how you can track week to week and month to month trends. Tracking a 90-day trend may be one of the single most important things you could do for your health and life. Just a small improvement in weight and or body composition over a 90-day period has huge implications for your metabolic health. Rather than worrying about what the values are for weight and body fat percentage, strive to consistently see a move in the right direction every 90 days. Once you have logged your first successful 90 days even holding your ground for a 90 day period is a worthwhile accomplishment. Celebrate this maintenance and use that momentum to take another swing at more progress. Remember to keep your heart fixed on the single most important reason changing your body composition matters to you. Are you currently on a streak of consistent weight loss? Are you currently on a streak of very committed healthy eating including limited sugar? If you answer no to both of those, there is something you need to know before you start tracking your body fat percentage. When you are not in an optimal metabolic state, you retain more water. This means that even your muscle cells swell like water balloons. They are larger as a result of elevated insulin levels in your body, but they are not stronger or more functional for their size. They are just bloated. When you begin strength training and eating healthier (ie., reducing sugar intake) you can quickly improve your insulin levels and reduce water retention. Do you remember how I said BIA scales work? They are very sensitive to hydration status. If you start to make a positive change the first several pounds you lose will be water weight. All your scale see is less water in your muscle cells, and it can only conclude your muscles have gotten smaller. In reality, they have, but remember when this happens they are just less swollen. If you are getting stronger at the same time, then you can rest assured that you aren’t losing the actual contractile protein that makes your muscles contract. In other words, your muscle did not atrophy. The problem is that when these BIA scales pick up on your initial water loss the calculation they make that concludes your muscles are smaller means that your reported body fat percentage will go up! This can be very frustrating. Imagine for two weeks you eat perfectly and perform your strength training only to watch the body fat percentage reading on your scale increase! You have to push through this. It’s fake news to borrow a popular term of the day! If you are eating well and your weight goes down on the scale that’s what you should focus on. After your first 1-2 weeks of healthier habits you achieve a sort of recalibration, and from that point forward you should see your body fat decrease in proportion to your weight decreases. Stick to the plan. Get your daily data point, compare weeks, and keep going. You will see on paper just when you pushed through this initial measurement anomaly. And, remember, research shows that there is a huge amount of benefit to your metabolism and health from the first five percent of body-weight that you lose. No matter how many times you have tried before, you can do it!